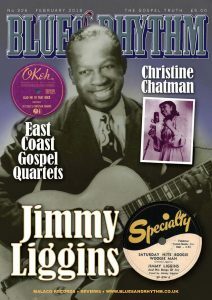 Welcome to Blues & Rhythm! BARGAIN BIN BROWSING: Nineteen years on from the original research Opal Louis Nations and Bob Bell have produce another major feature on Budget Blues, R&B and Gospel vinyl album from the US and this time from UK. ROBERT JOHNSON: Second part of Gayle Dean Wardlow’s series on ‘Searching For Robert Johnson’. 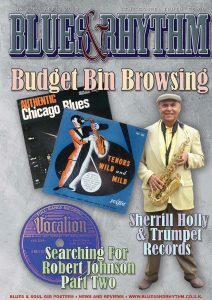 SHERRILL HOLLY INTERVIEW: Mike Stephenson interviews Jackson, Mississippi saxman about Trumpet Records and the Farsh Street music scene in he 1940s and 1950s. OFF THE WALL: Great R&B and Soul gig posters from the collection of Dave Williams. 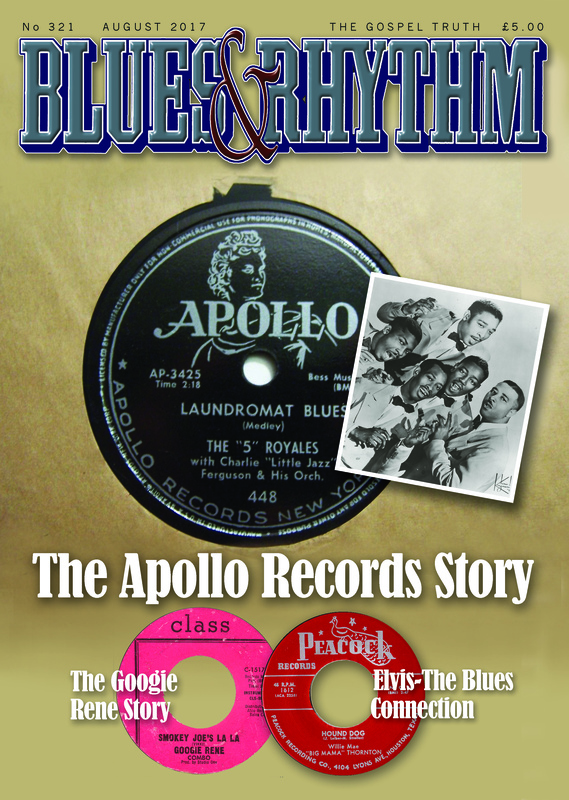 THE BLUES DISCOGRAPHY THIRD EDITION: Special feature by Phil Wight on the newly published third edition of the Blues Discography. 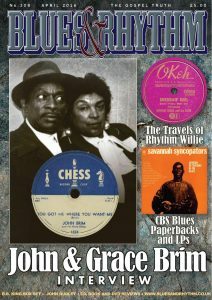 PLUS: Bill Sims, Jackie Shane, Izzy Young; Cedric Burnside, Rick Estrin & The Nitecats gigs; Blues Unlimted Exhibition; Chris Bentley’s Curiosities; Chris Smith’s Words, Words; Words; Mike Stephenson’s Under The Radar; CD & Book Reviews including Henry Townsend & Roosevelt Sykes, Ivory Joe Hunter, Willie Dixon, Texas Hillbillies, Mahalia Jackson and many more. 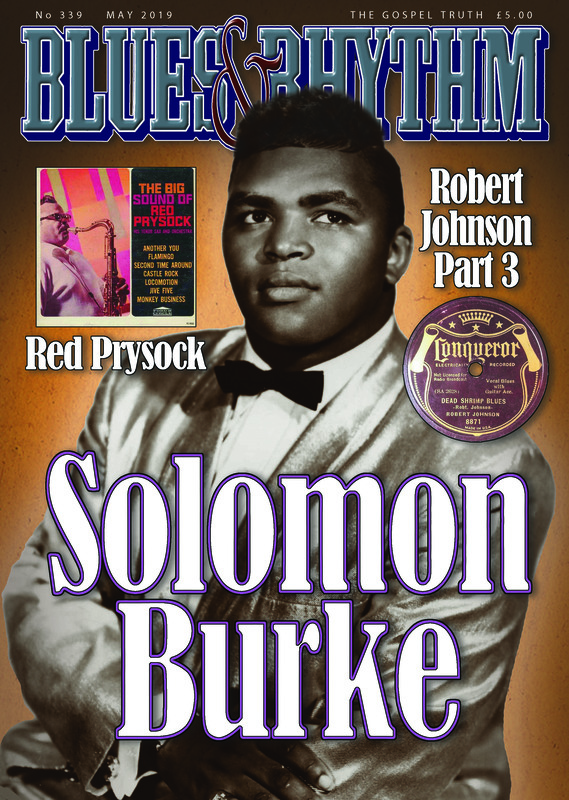 SOLOMON BURKE: ‘The King’s Comeback – The Remaking Of A Solomon Burke Classic’ – Unique, extensive and exclusive article written by producer Scott Billington. ROBERT JOHNSON: Final part of Gayle Dean Wardlow’s series on ‘Searching For Robert Johnson’. THE MR. R&B TAPES – RED PRYSOCK: The first of a series of edited transcriptions of Jonas Bernholm’s audio tapes used for the sleevenotes of his Route 66 stable of reissue labels. Paul Williams interviews Red Prysock (more interviews more to come). OFF THE WALL: Part Two of street posters from the Dave Williams Collection. PLUS: Quintus McCormick; Eddie Taylor Jnr; Abb Locke; Chris Bentley’s Curiosities; Chris Smith’s Words, Words, Words; Mike Stephenson’s Under The Radar; CD Reviews includiong Mary Lane, Julia Lee, Bullmoose Jackson, Koko Mojo compilations. GOSPEL QUARTETS: Ray Templeton ends his series on great gospel quartets with a look at the Fairfield Four, The Southern Sons, The Pilgrim Travelers and others. ROBERT JOHNSON: First part of Gayle Dean Wardlow’s series on Searching For Robert Johnson’. 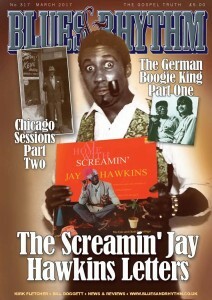 CALVIN BARRON: The sixth in Robert Pruter’s series on rare Chicago Soul Artists. PLUS: Clydie King; Ace Cannon; Chris Bentley’s Curiosities; Chris Smith’s Words, Words; Words; Mike Stephenson’s Under The Radar; CD & Book Reviews including Bloodest Saxophone; Cedric Burnside; Big Joe Turner; Big Jay McNeeley; Delbert McClinton. 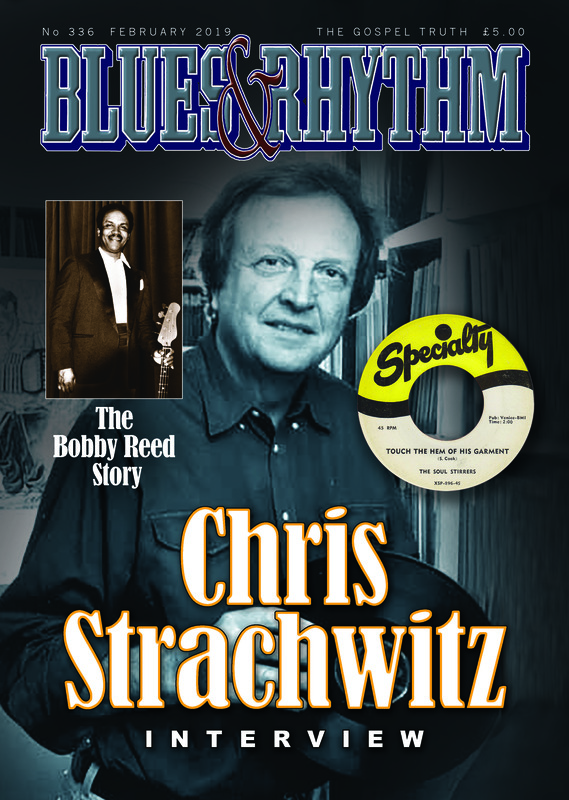 CHRIS STRACHWITZ INTERVIEW: Part One of a major two part interview by Garth Cartwright with the Arhoolie Records boss. 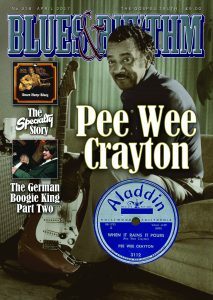 Fantastic blues, roots and record collecting music history. GOSPEL QUARTETS: More classic gospel music history as Ray Templeton looks the Specialty recordings of Sam Cooke and The Soul Stirrers. 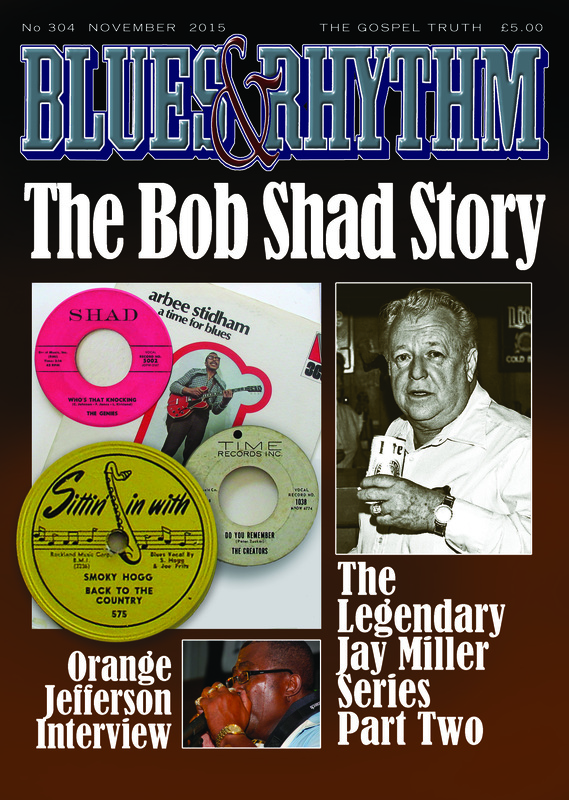 THE BOBBY REED STORY: Dave Williams tells the story of west coast bluesman and bandleader of The Right Kind who recorded for Galaxy Records. RPM 45’s UPDATE: Victor Pearlin adds to his great research on 45rpm discs issued by the Bihari’s RPM label with the help of Ray Astbury and Dan Kochakian. 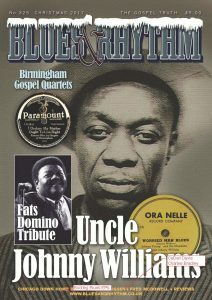 PLUS: Elder Roma Wilson; Eddie C. Campbell, Jody Williams, Calvin Newborn, Tony Joe White, Gerard Homan; Blues Festival Reports; Chris Bentley’s Curiosities; Chris Smith’s Words, Words; Words; Mike Stephenson’s Under The Radar; CD & Book Reviews including Joe Louis Walker, Floyd Dixon, Helen Humes, Prince Buster, Trojan Records 50th Anniversary. THE SHELDON STUDIOS – Dietmar Rudolf’s extensive feature on the Sheldon Studios in Chicago. Jack Sheldon was responsible for engineering and mastering some of the great Chess blues and R&B hits and albums. Great piece of reserach. B. 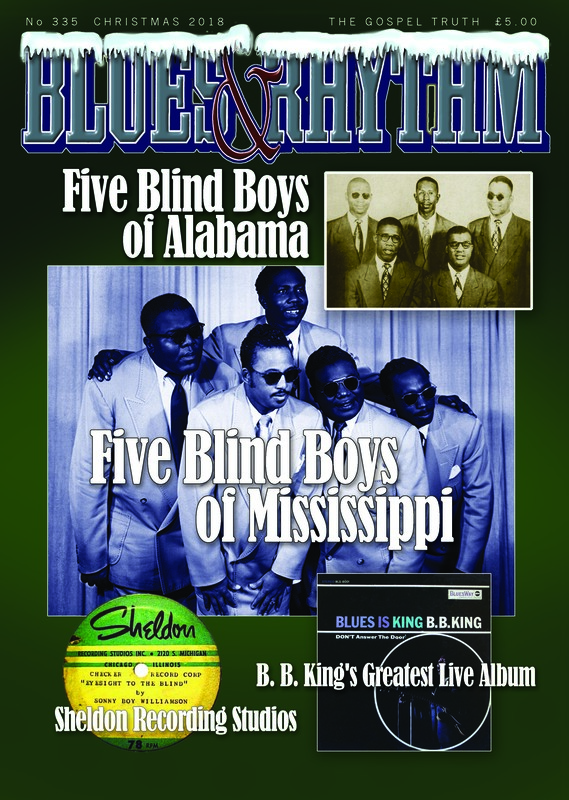 B. KING’S GREATEST LIVE ALBUM: RARE BLUES RECORDS RESEARCH: Otis Grand examines in detail B. B. King’s ‘Blues Is King’ album cut in Chicago in 1966 – Otis says it was B.B.’s ‘greatest live album’. WILLIE PARKER – FRANKIE NEWSOME; Robert Pruter’s latest installment in his great series on rare and obscure Chicago soul artists. 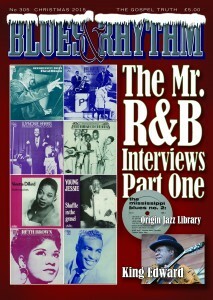 MORE GREAT 1950s AND 1960s R&B HISTORY: Bill Greensmith’s extensive research and feature on M.C. Reeder and the T99 Club, in Osceola, Arkansas. RARE BLUES RECORDS RESEARCH: Victor Pearlin RPM Records 45rpm discs and a special feature curated by Dan Kochakian on Modern & RPM 7inch 78rpm promo discs! HILL COUNTRY BLUES TODAY! 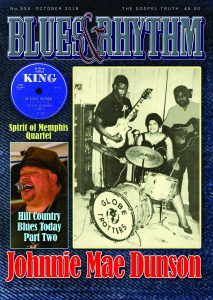 : The second part of Mike Stephenson’s overview of blues from the Mississippi Hill Country – featuring Little Joe Ayres, Lightnin’ Malcom and Kenny Brown. THE VERSALETTES: Robert Pruter’s continuing historical series looking at rare Chicago soul artists. ARETHA FRANKLIN: Billy Vera pays tribute to the ‘Queen Of Soul’ who died in August. 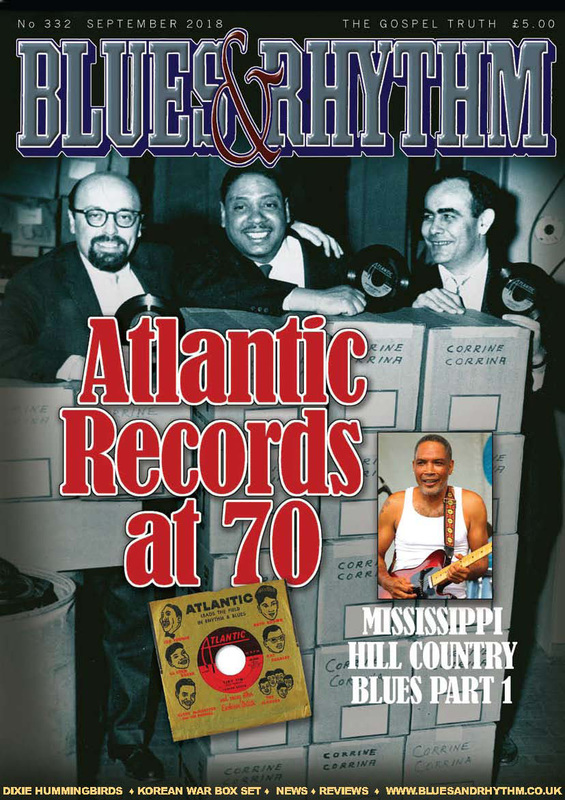 ATLANTIC AT 70: Billy Vera marks the 70th anniversary of the birth of Atlantic Records, with great photos from his extensive files. HILL COUNTRY BLUES TODAY! 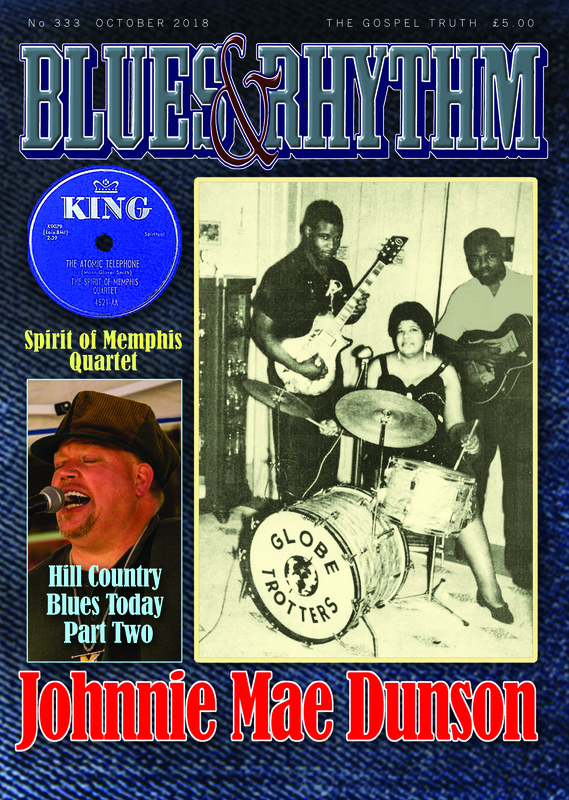 : The first part of Mike Stephenson’s overview of blues from the Mississippi Hill Country – featuring The Burnside and Kimborough families. 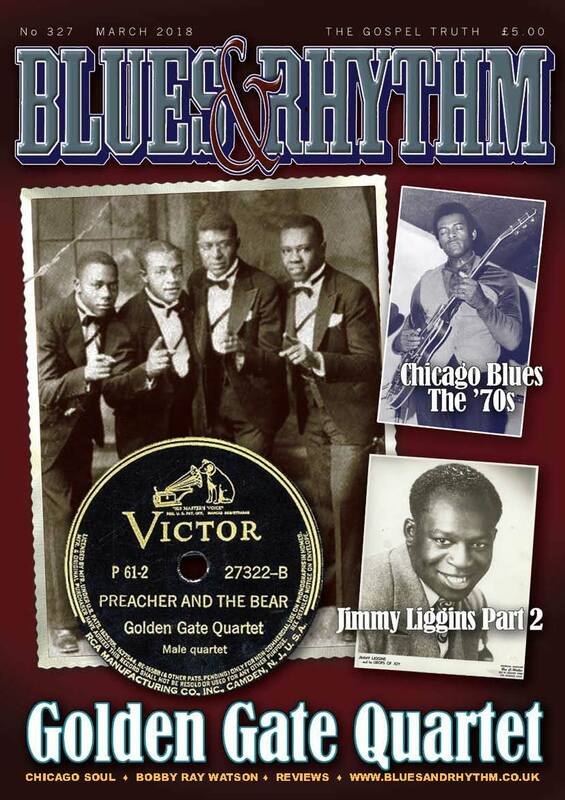 KOREA BOX SET: Tony Burke reviews the new Bear Family 4 CD box set of blues, country, bluegrass and popular music connected with the Korean War. STUFF YOU DON’T SEE EVERYDAY: Jay Bruder’s photo feature on 78rpm picture sleeves. GOSPEL QUARTETS Ray Templeton looks at all-women quartets and women gospel singers who recorded with gospel quartets including, Elite Jewels, Songbirds of the South, Marie Knight and the Georgia Peach. QUE MARTYN: Opal Louis Nations and Bob Eagle tell the story of Bay Area bandleader and sax player Que Martin with complete with historical photographs and a full discography. DONALD JENKINS AND THE DELIGHTERS: Another installment in Robert Pruter’s series on rare and obscure Chicago Soul artists. TOUGH ENOUGH: Exclusive preview of the forthcoming Weinerworld box set of New York, Cincinnati and East Coast Downhome Blues. 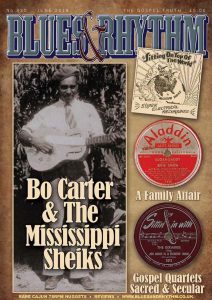 RARE CAJUN NUGGETS: Great two page feature on rare and unique Cajun 78rpm discs by lyle Ferbrache. 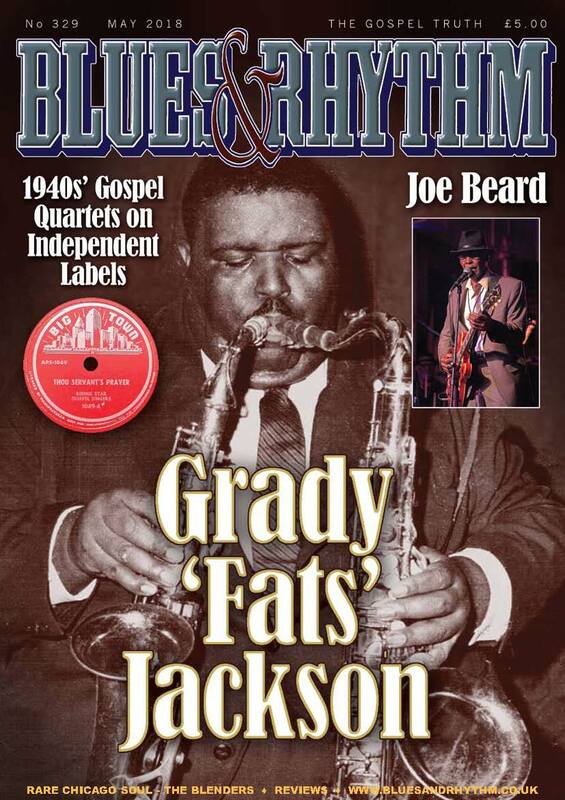 GRADY ‘FATS’ JACKSON: Dan Kochakian tells the story of Grady Jackson the 1940s and 1950s Atlanta sax legend with new information and photos courtesy of his family. 1940s’ GOSPEL QUARTETS ON IDENPENDENT LABELS: Ray Templeton looks at 1940s Gospel Quartets on labels such as Bronze, Manor, Regis, Big Town and King Solomon. 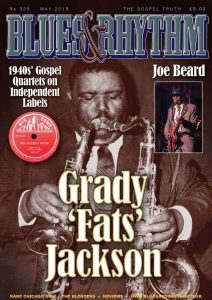 JOE BEARD: Scott M. Bock interviews veteran bluesman Joe Beard who talks about his early life in Mississippi, his time in memphis his freindship with Son House in new York. THE CHICAGO SOUL SERIES: Number two in Robert Pruter’s series focuses on 1960s Chicago vocal group The Blenders. 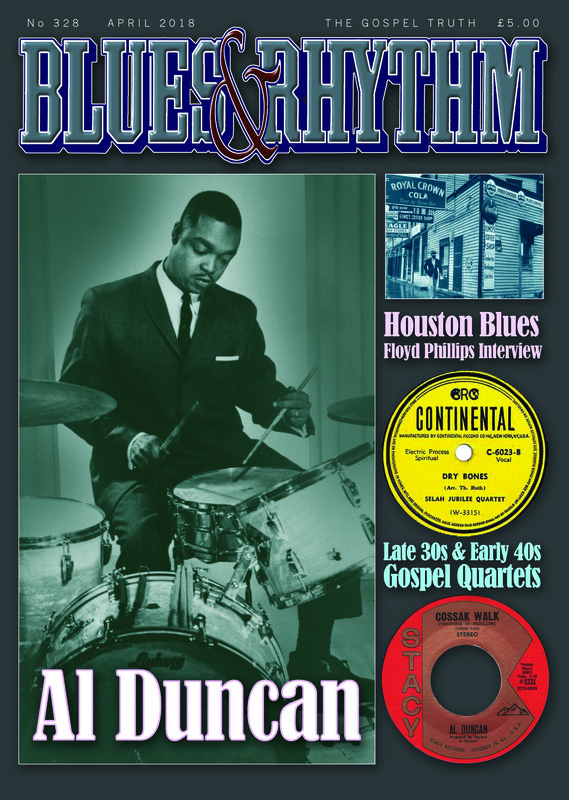 AL DUNCAN: Bill Greensmith interviewed the legendary drummer Al Duncan back in 1975. 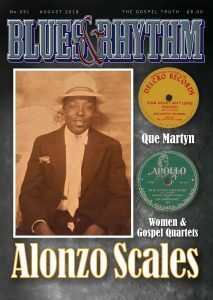 Al played on countless Blues, R&B and Soul sessions from the 1940s through to the 1970s. We publish Bill’s extensive interview for the first time. 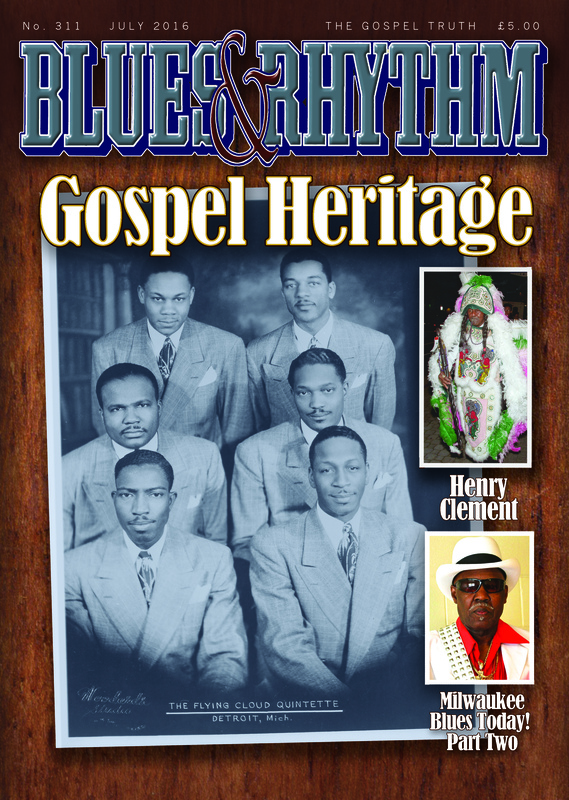 GOSPEL QUARTETS OF THE 1930s & 1940s: Ray Templeton looks at the 1930s and 1940s recordings of The Selah Jubilee Singers, The Coleman Brothers, The Southern Sons & The Harmonizing Four in his series ‘Ain’t That Good News’ – more great gospel music research. 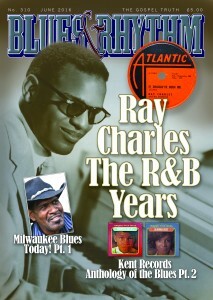 RU-JAC RECORDS: Tony Burke looks at four new CD releases of rarities from the vaults of this iconic Baltimore R&B and Soul label. QUARTET SUPERSTARS OF THE 1930s: Ray Templeton looks at the classic early recordings of the Golden Gate Quartet and the Heavenly Gospel Singers in his series ‘Ain’t That Good News’ – fantastic gospel music research. 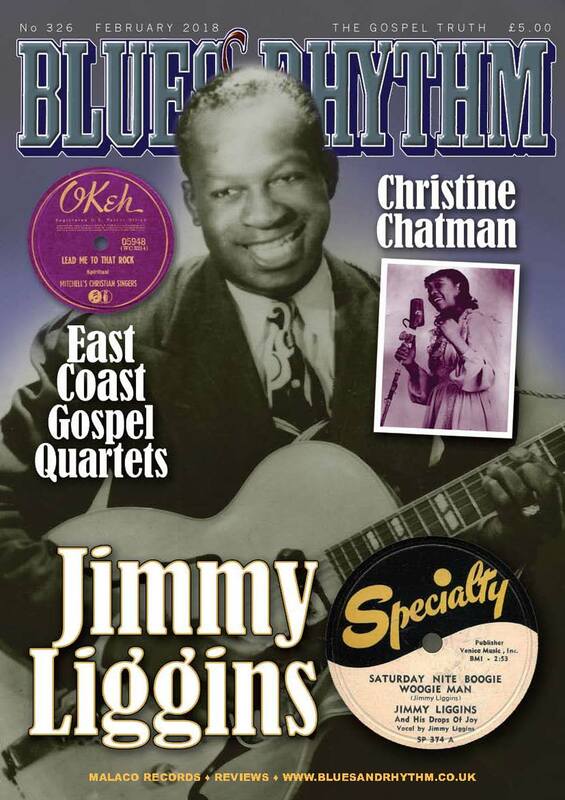 JIMMY LIGGINS PART 2: The second part ot a two part feature by Seamus McGarvey based on tape transcriptions made for Jonas Bernholm by R&B star with Jimmy Liggins talking about his recordings and life in the music business. BOBBY RAY WATSON: T. DeWayne Moore tells the story of ‘The Colonel’ Bobby Ray Watson who helped promote and support the Memphis Blues Revival of the 1960s and 1970s. MATTIE MAY THOMAS: Great research by Mike Daley on the recordings made by this mystery pre-war blues artist. THE CHICAGO SOUL SERIES: The first in a brand news series from Robert Pruter on rare and obscure Chicago artists from the Windy City. This issue Jospehine Taylor. 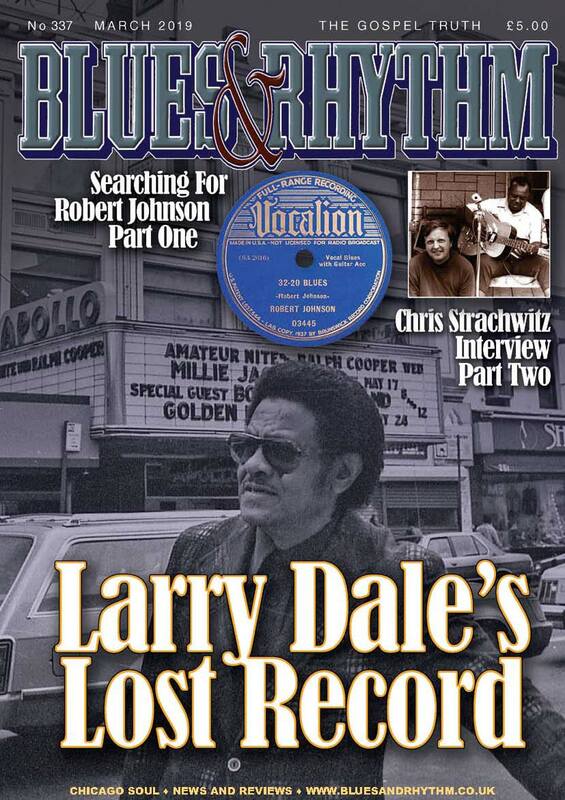 CHICAGO BLUES IN THE 1970s: Norman Darwen reviews Storyville’s seven CD ‘Chicago Blues Box Number Two’ of recordings cut for MCM Records including Eddie Taylor, Hip Lankchan, Magic Slim, Jimmy Dawkins, Jimmy Johnson and others. JIMMY LIGGINS PART 1: First part of two parter by Seamus McGarvey based on tape transcriptions made for Jonas Bernholm by R&B star Jimmy Liggins talking about his recordings and life in the music business. CHRISTINE CHATMAN: Dan Kochakian follows his and Dave Penny’s research on the great R&B singer and pianist with lots of new information. EASTERN STATES QUARTETS: Ray Templeton’s next feature in this great series of ‘Ain’t That Good News’ looks at East Coast gospel quartets – including Mitchell’s Christian Singers, Silver Leaf Quartet and the Biddle University Quartet – wonderful historical research. MALACO RECORDS:: Mike Stephenson interviews Malaco Records boss Tommy Crouch Jnr. 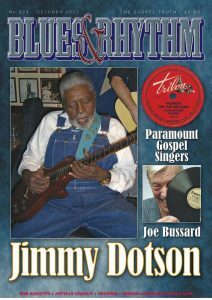 UNCLE JOHNNY WILLIAMS: Great historical interview by D. Thomas Moon with the early post war Chicago bluesman. 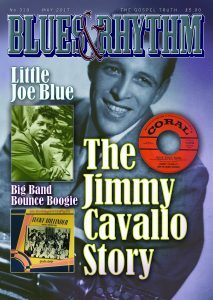 FATS DOMINO TRIBUTE: Billy Vera pays tribute to The Fat Man in a three page special feature. BIRMINGHAM – JEFFERSON COUNTY QUARTETS: Ray Templeton’s second feature in this great series of ‘Ain’t That Good News’ looking at gospel quartets – fantastic and historical research. 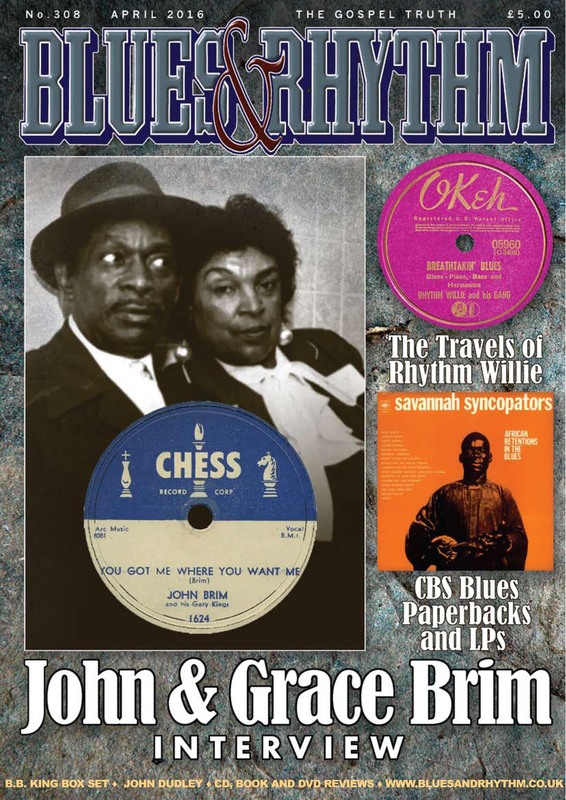 EXTENDING THE BLUES: B&R contributors recall the days of bootleg blues EP’s – John Broven, Robin Gosden, Dave Clark, Pete Goldsmith and others. R. L. BOYCE: Interview and gig report from R.L.’s recent visit to London by Mike Stephenson & Gareth Hughes. 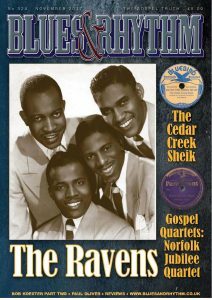 THE RAVENS: Great interview from the vaults by Seamus McGarvey with Warren Suttles a one time member of the legendary vocal group. 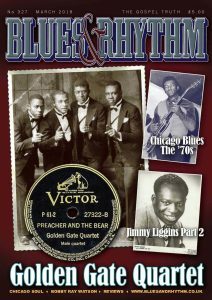 JUMPIN’ IN CHICAGO: Chris Bentley’s extensive review of the new Chicago Down Home Blues Box set released by Weinerworld. THE NORFOLK JUBILEE QUARTET: Ray Templeton kicks off a new series ‘Ain’t That Good News’ looking at gospel quartets -some great research coming up! THE CEDAR CREEK SHEIK: Fantastic historical research on this obscure pre-war bluesman by Chris Smith, Tony Russell with Mary Asfaw Matthews. JIMMY DOTSON: Great interview by Keith Schoffam with the legendary Houston-Louisiana bluesman who recorded for Zynn, Rocko and Home Of The Blues. 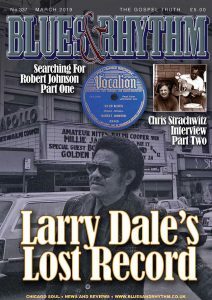 THE BOB KOESTER INTERVIEW PART TWO: Second part of Mike Stephenson’s extensive interview with Bob Koester about Delmark Records, Jazz record Mart, finding Sleepy John Estes, Otis Rush, J. B. Hutto, Jimmy Dawkins, Magic Sam and many more. THE PARAMOUNT GOSPEL SINGERS: Great post war gospel research on the early years of the classic Bay Area quartet by Opal Louis Nations. A DAY WITH JOE BUSSARD: D. Thomas Moon interviews the King Of Record Collectors Joe Bussard about collecting blues and country 78s and the American Epic TV series and box set. PAUL OLIVER : Neil Slaven pays tribute the the late Paul Oliver who died in August. 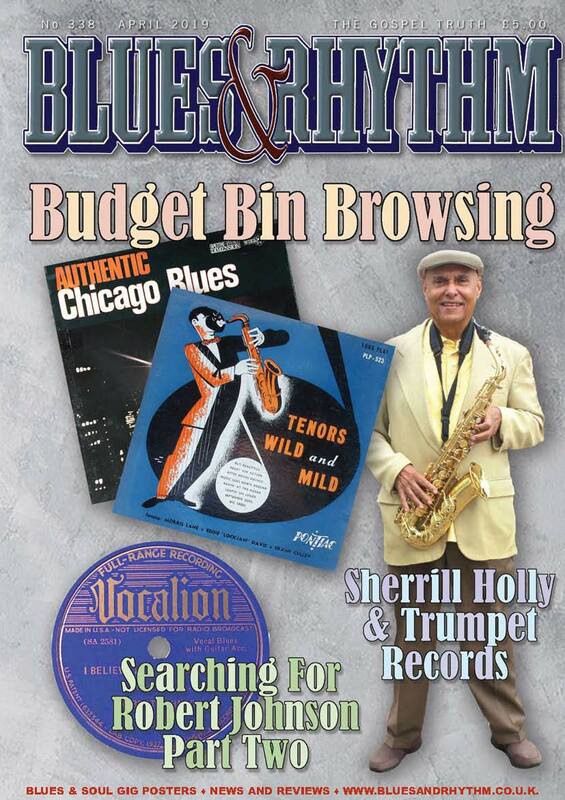 THE BOB KOESTER INTERVIEW PART ONE – Mike Stephenson’s extensive interview with Delmark Records boss Bob Koester about his early years selling records via mail order, his Jazz Record Mart business and finding blues artists such as Big Joe Williams. EDDIE KIRKLAND INTERVIEW – Norman Darwen digs further into his vaults and turned up a 1987 interview with Eddie conducted in London with lots of new information on his recordings for Tru Sound and Prestige. 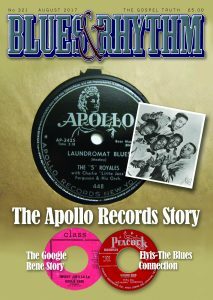 THE APOLLO RECORDS STORY – Billy Vera tells the story of the pioneering 1940s and 1950s indie label owned by Bess and Ike Berman. SUNFLOWER RECORDS – Ray Templeton looks back at another bootleg series of albums issued in the late 1960s by Pete Moody. ELVIS AND THE BLUES – Bob Groom updates an original work on Elvis and his blues influences on the 40th anniversary of the King’s death. THE GOOGIE RENE STORY – Great research by Steve Propes in this feature on record producer, label owner, songwriter and pianist Googie Rene. OFF THE WALL – This time Tommy Lofgren with some great posters for blues gigs from the 1960s and 1970s. 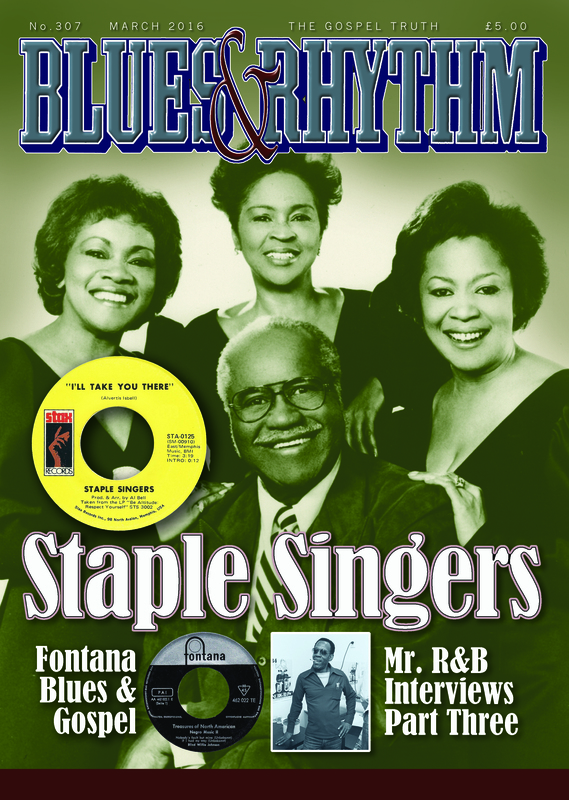 THE SOUL STIRRERS – THE EARLY YEARS – Opal Louis Nations takes a look at the early recordings of the great gospel quartet The Soul Sirrers. BLUES OBSCURITIES – Ray Templeton looks back at the original Blues Obscurites bootleg albums and the the official releases issued by London Records. CHUCK BERRY – Billy Vera pays a personal tribute to Chuck – with some great anecdotes and stories. MUSIC MAKER FOUNDATION – Mike Stephenson’s detailed feature/interviews on the charitable organisation which helps blues artists get recognition – includes Beverly ‘Guitar’ Watkins; Albert White; Eddie Tigner; Sam Frazier Jnr etc. OFF THE WALL – A Bob McGrath feature on the great gig posters from the golden age of 1950s Rhythm & Blues. JIMMY CAV ALLO – Dan Kochakian and Chris Bentley interview the great white R&B sax player and bandleader who appeared in ‘Rock, Rock, Rock’ complete with discography. 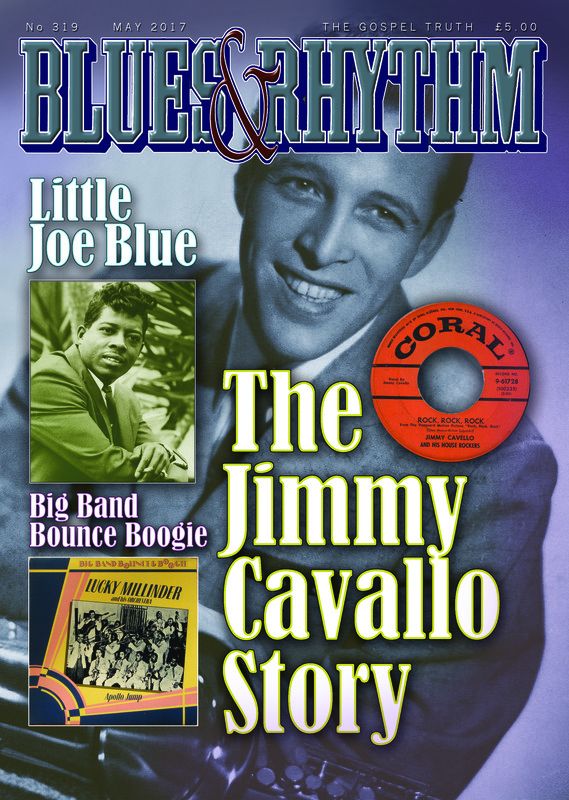 BIG BAND BOUNCE BOOGIE – Ray Templeton looks back at the Affinity re-issue series of albums from 1980s with albums by R&B pioneers such as Lucky Millinder, Cootie Williams, Lionel Hampton, Jimmy Rushing and many more. CHUCK BERRY – Neil Slaven pays tribute to the late Chuck Berry in his own inimitable style. DOROTHY PRINCE – Robert Pruter takes a look at the career of the 1960s Chicago soul singer. 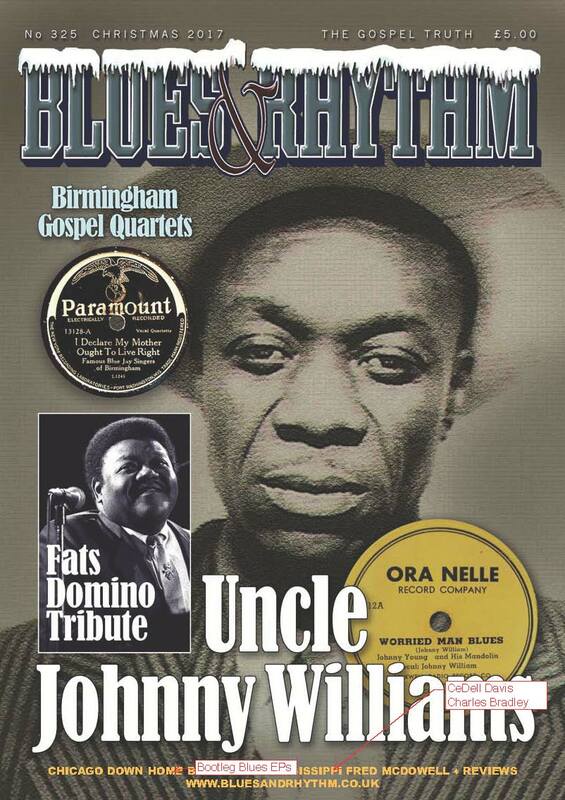 LITTLE JOE BLUE– Opal Louis Nations on the recordings of Joe Valery aka bluesman Little Joe Blue. 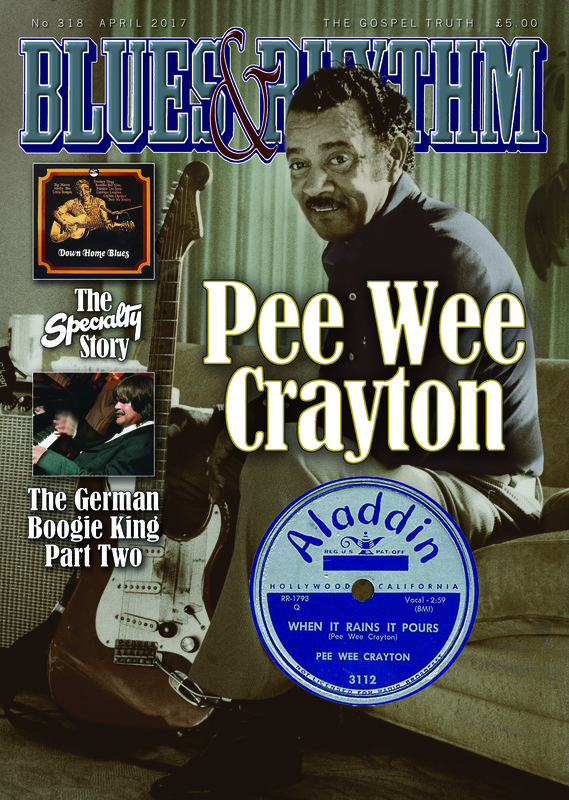 PEE WEE CRAYTON INTERVIEW – Bill Greensmith has dug deep into his files and comes up with this great interview with the master of the West Coast Blues. THE SPECIALTY STORY – Ray Templeton goes back to the 1980s and provides a fascinating overview of the classic series of vinyl re-issue albums from the Specialty Records vaults. THE GERMAN BOOGIE KING PART TWO: German boogie and blues pianist Axel Zwingenberger is in further discussions with Michael Hortig talking about his recordings with Lionel Hampton, Jay McShann, James Crutchfield, Sippie Wallace and Champion Jack Dupree. 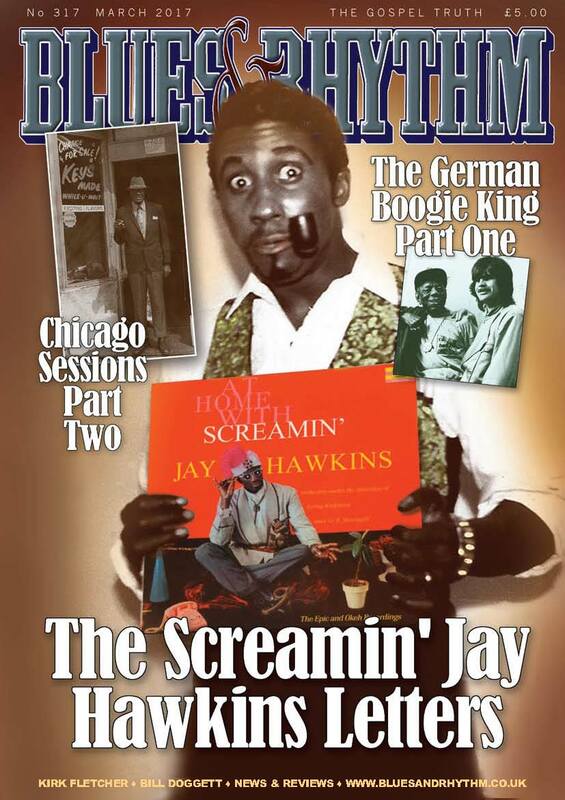 THE SCREAMIN’ JAY HAWKINS LETTERS – Jonas Berholm recounts the trials and tribulations of trying to get a record deal with the R&B legend – it wasn’t easy. Great R&B history by the Route 66 stable of labels’ Jonas Bernholm. CHICAGO BLUES SESSIONS PART TWO – Ray Templeton looks at the great album reissues of recordings issued by Cadillac Baby and the Ralph Bass Sessions which produced the I Didn’t Give A Damn If White’s Bought It’. THE GERMAN BOOGIE KING – PART TWO: German boogie and blues pianist Axel Zwingenberger talks to Michael Hortig about his career with blues artists such as Champion Jack Dupree, Eddie Vinson, Big Joe Turner, Mama Yancy, Lloyd Glenn and others. KIRK FLETCHER INTERVIEW – Mike Stephenson interviewed U.S. blues artists Kirk Fletcher on his recent UK tour. BILL DOGGETT CENTENARY – Rare photos and memorabilia compiled by Bill Doggett’s nephew to celebrate 100 years of the R&B organist and pianist. Plus: Chris Smith’s ‘Words, Words, Words’; Chris Bentley’s ‘Curiosities’; Mike Stephenson’s ‘Under The Radar’; Rhythm Riot; Terry Cryer; Nat Hentoff; Sven Zetterberg; CD, DVD, book reviews. 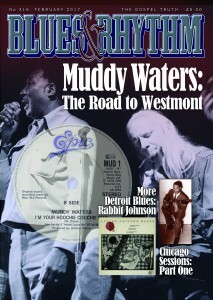 MUDDY WATERS, THE WESTMONT YEARS – D. Thomas Moon’s lengthy feature on Muddy’s ‘Westmont Years’, his late 1960s and early 1970s recordings with insights and contributions from Billy Boy Arnold, James Cotton, Willie ‘Big Eyes’ Smith, John Primer, Pinetop Perkins and Eddy Clearwater. CHICAGO BLUES SESSIONS PART ONE – Ray Templeton looks Vanguard’s classic ‘Chicago/The Blues/Today’ series, Alligator’s great ‘Living Chicago Blues Series and ‘The New Bluebloods’ album in the first part of a two parter which will also look at 1960s Chicago blues in ‘Meat & Gravy’ and the Ralph Bass Sessions series. CONVERSATION WITH RABBIT JOHNSON: The final installment in Mike Rowe’s great Detroit blues interviews, this time Mike interviews guitarist Rabbit Johnson (with Bob Jenkins in the background). SLIM HARPO – Howard Rye reviews Martin Hawkins’ new new biography of Harpo. JONTAVIOUS WILLIS – Mike Stephenson interviews the new critically acclaimed country blues artist. Plus: Chris Smith’s ‘Words, Words, Words’; Chris Bentley’s ‘Curiosities’; Mike Stephenson’s ‘Under The Radar’; Clifford Curry; Billy Miller; Herb Hardesty; Mose Allison; Joe Ligon; Lucerne and Bay-Car Festivals; CD, DVD, book reviews. 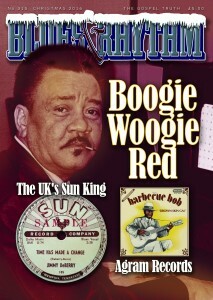 A CONVERSATION WITH BOOGIE WOOGIE RED – During the 1970s Mike Rowe met with a number of Detroit bluesmen. 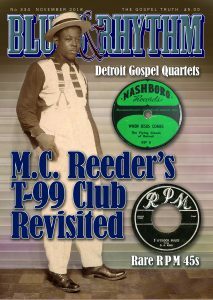 In B&R 315 we publish Mike’s lengthy conversation with Boogie Woogie Red in our ‘Mike Rowe’s Detroit Blues’ series. 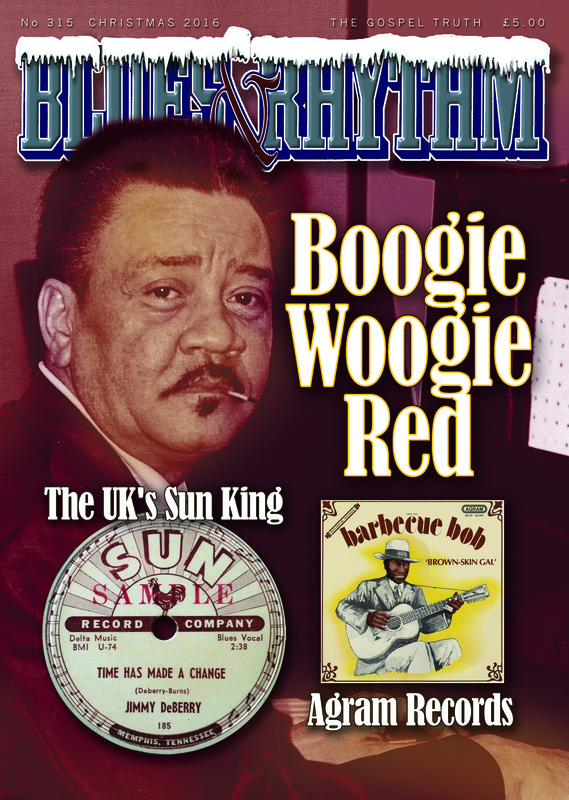 AGRAM RECORDS – Ray Templeton looks at Guido van Rijn’s pre-war blues series of albums from the likes of Barbecue Bob; Alice Moore; Scrapper Blackwell; Charley Jordan; Washington Phillips and many others. PHILLY SOUL & R&B – Tony Watson takes a look at a a new book tracing the history of R&B and Soul in the City of Brotherly Love. THE SUN KING OF THE UK – Lyle Ferbrache talks to record collector Larry Williams about his unquie collection of Sun recordings including some amazing rarities. Plus: Chris Smith’s ‘Words, Words, Words’; Chris Bentley’s ‘Curiosities’; Mike Stephenson’s ‘Under The Radar’; Mississippi Festival Reviews; Ted Harvey; Ray ‘Killer’ Allison; Stanley ‘Buckwheat’ Durell; CD and DVD reviews. 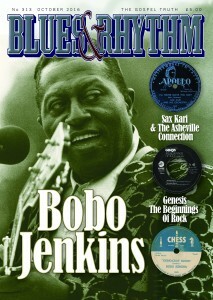 A CONVERSATION WITH BOBO JENKINS PART TWO – During the 1970s Mike Rowe met with a number of Detroit bluesmen. In our next issue we will publish the second part of a lengthy conversation with Bobo Jenkins in our ‘Mike Rowe’s Detroit Blues’ series. Plus a full label listing of Bobo’s Big Star label with rare label shots. CHESS GOLDEN DECADE – Ray Templeton looks at the classic eight volume reissue series released in the 197o’s which featured classic and rare racks from the Chess stable of labels. 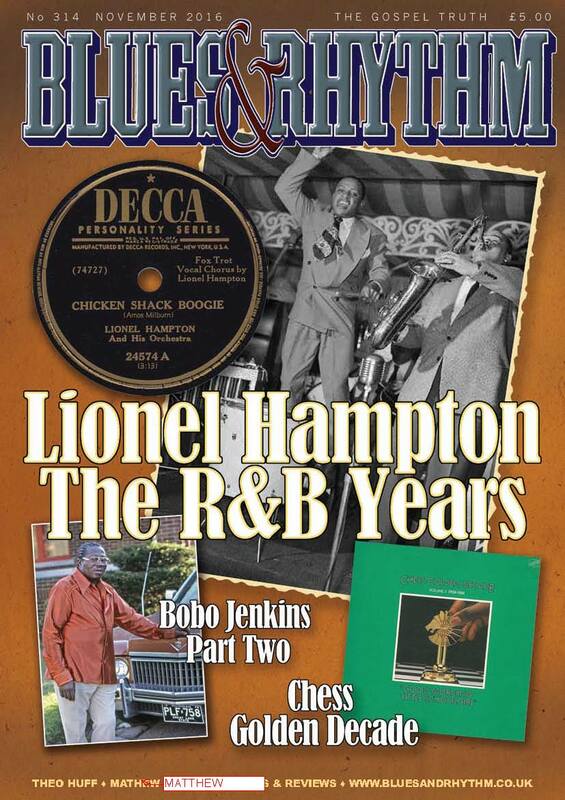 LIONEL HAMPTON – THE R&B YEARS – Billy Vera takes a look at Hamp’s R&B Records with great photos from the era. THEO HUFF – Mike Stephenson interview this up and coming soul-blues artist. Plus: Chris Smith’s ‘Words, Words, Words’; Chris Bentley’s ‘Curiosities’; Mike Stephenson’s ‘Under The Radar’; Prince Buster; CD and DVD reviews. 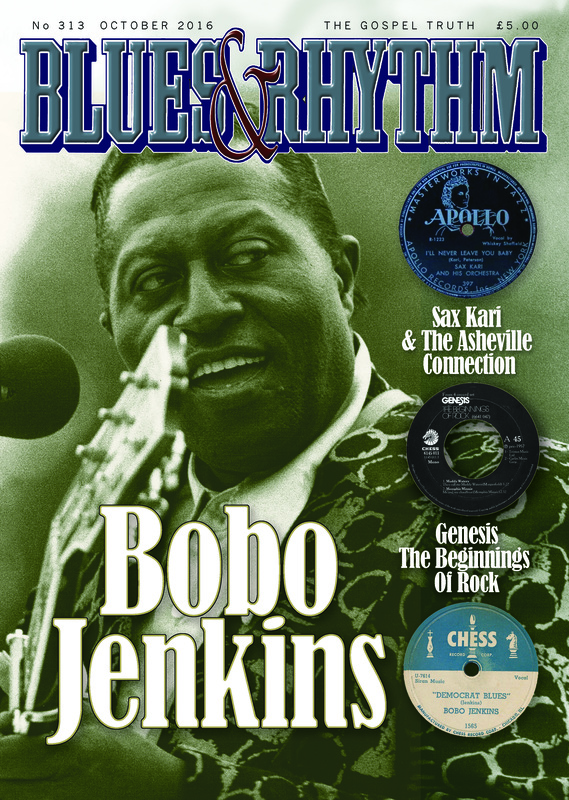 A CONVERSATION WITH BOBO JENKINS PART ONE – During the 1970s Mike Rowe met with a number Detroit bluesmen. In our next issue we will publish the first part of a lengthy conversation with Bobo Jenkins in our ‘Mike Rowe’s Detroit Blues’ series. GENESIS: BEGINNINGS OF ROCK BOX SETS – Ray Templeton looks at the classic three box sets released in the 197o’s which featured rare Chess tracks and set the standard for future reissue series. SAX KARI AND THE ASHEVILLE R&B CONNECTION- The ever intrepid Dan Kochakian continues his pursuit of information on the R&B pioneer Sax Kari and visits Asheville in North Carolina with surprising results! Plus: Review of the ‘Detroit Special’ box set; Chris Smith’s ‘Words, Words, Words’; Edinburgh Festival; Chris Bentley’s ‘Curiosities’; Mike Stephenson’s ‘Under The Radar’; CD and DVD Reviews. 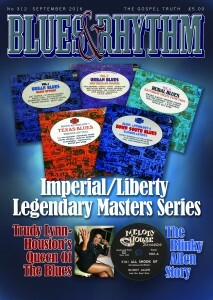 THE IMPERIAL – LIBERTY LEGENDARY MASTERS SERIES – Ray Templeton’s over view of the one of the most famous blues and rhythm and blues reissue series – originally produced by Canned Heat’s Bob Hite. 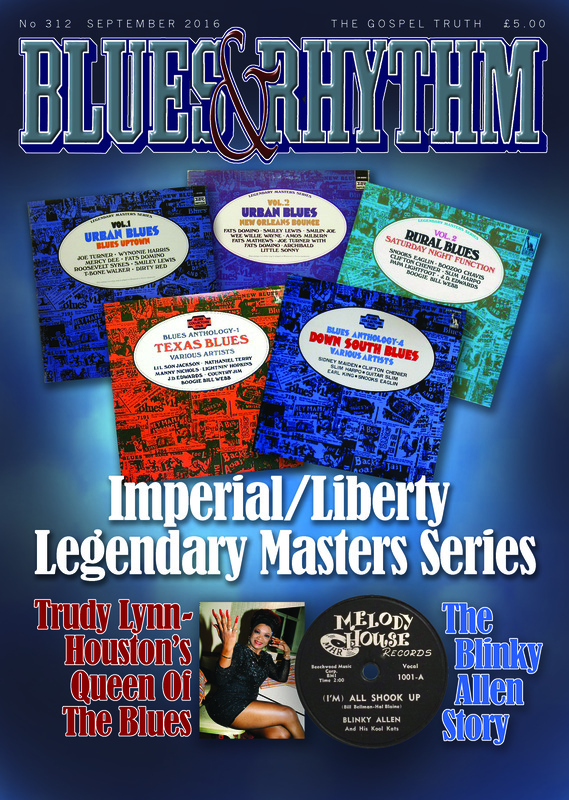 TRUDY LYNN – HOUSTON’S QUEEN OF THE BLUES – Mike Stephenson’s interview with Trudy who tells of her early years in Houston with the likes of Big Walter Price. 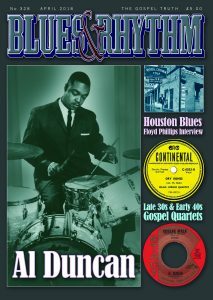 THE BLINKY ALLEN STORY – More rhythm and blues obscurities – this time an article by Ray Astbury on drummer and bandleader Blinky Allen. Plus: As all our regular columns including: Chris Bentley’s ‘Curiosities’; Mike Stephenson’s ‘Under The Radar’; Chris Smith’s ‘Words, Words Words’; Letters; Reviews; News and reports from gigs and festivals in Chicago & Mississippi. 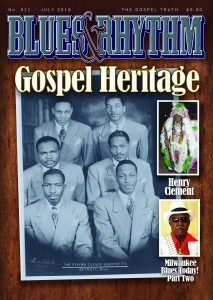 GOSPEL HERITAGE – Ray Templeton’s over view of the Gospel Heritage series of classic gospel vinyl abums. HENRY CLEMENT – Ian Saddler tells the story of this enigmatic Louisiana musician sometimes known as The Swap Doctah or Big Chief Takaawaka! 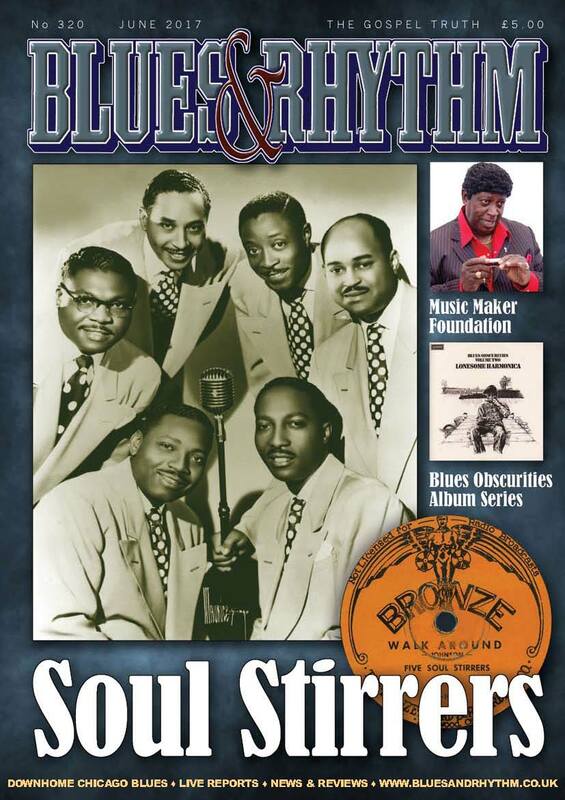 MILAWUKEE BLUES TODAY PART TWO – Mike Stephenson’s overview of the current Milwaukee Blues Scene featuring Milwaukee Slim, Marvelous Mack Jim Liban and others. Plus: As all our regular columns including: Chris Bentley’s ‘Curiosities’; Mike Stephenson’s ‘Under The Radar’; the return of Chris Smith’s ‘Words, Words Words’; Letters; Reviews; News. 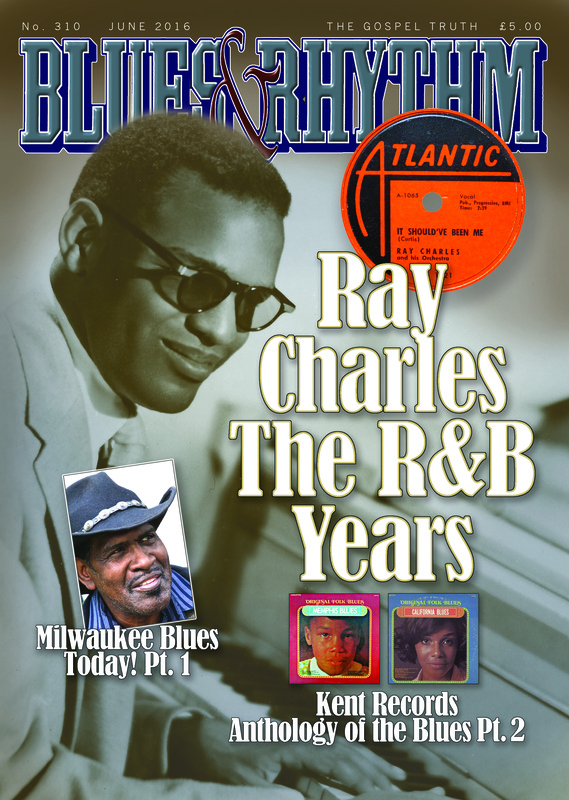 RAY CHARLES – THE R&B YEARS – Billy Vera takes an extensive look at at Ray’s recording career from the late 1940s to the early 1970s. 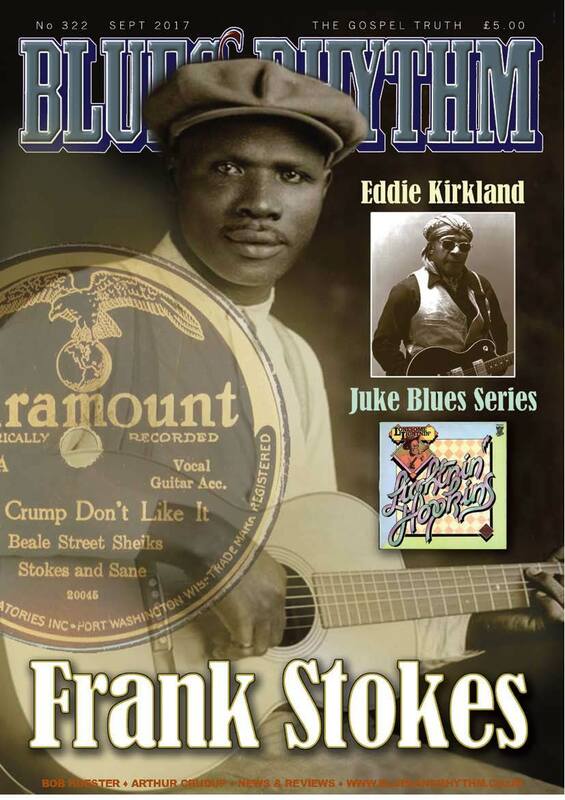 KENT ANTHOLOGY OF THE BLUES – Part Two of Ray Templeton’s two part look at at the legendary Kent series of compilations and single artist releases – Mississippi Blues, Detroit Blues, Arkansas Blues, etc plus Elmore James, B. B. King, Lightnin’ Hopkins. 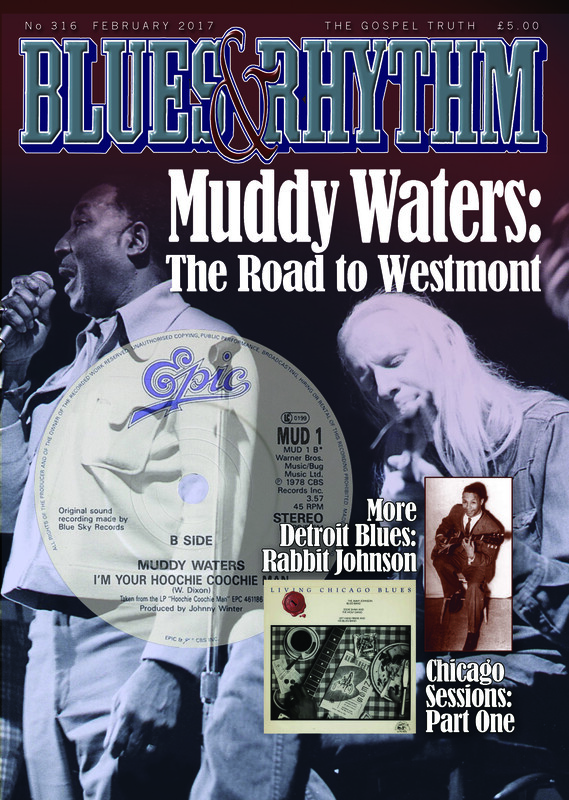 MILWAUKEE BLUES TODAY PART ONE – Mike Stephenson’s overview of the current Milwaukee Blues Scene featuring Harvey Westmorland, Gerome Durham, Steve Cohen and James Cosey. COSIMO AND EDDIE – John Broven on the relationship between New Orleans producer Cosimo Matassa and Goldband’s Eddie Shuler. P.P. ARNOLD – Seamus McGarvey talks to the singer P. P. Arnold about her early Gospel and R&B career. Plus Lonnie Mack; Letters; News; Steppin’ Out – as well as all our regular columns including: Chris Bentley ‘Curiosities’; Mike Stephenson’s ‘Under The Radar’ (Chris Smith’s ‘Words, Words Words’ is taking a break this month. 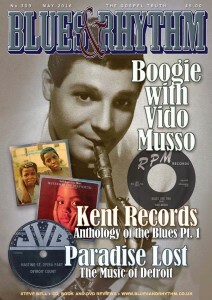 VIDO’S BOOGIE – Dan Kochakian tells the story of sax man Vido Musso – who played jazz for much of his career but cut some fine R&B recordings. 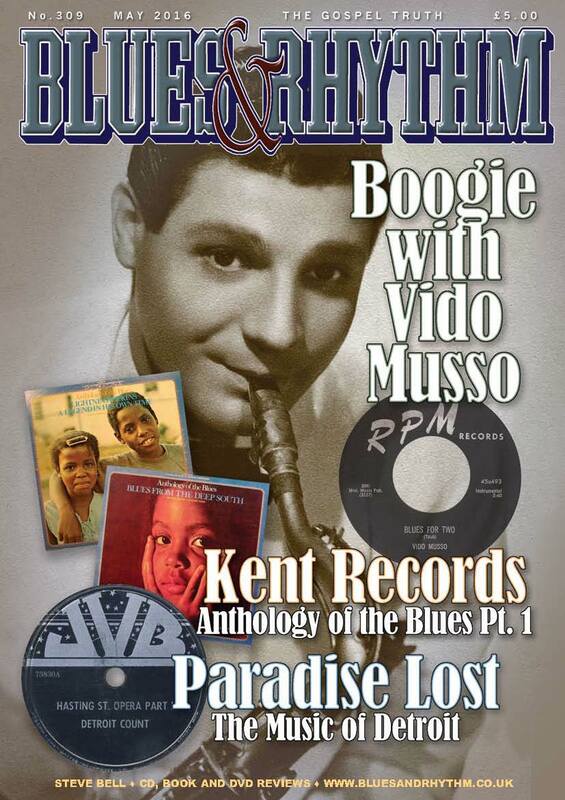 KENT ANTHOLOGY OF THE BLUES – Part One of a two parter from Ray Templeton who looks at the legendary Kent series of compilations and single artist releases – Mississippi Blues, Detroit Blues, Arkansas Blues, etc plus Elmore James, B. B. King, Lightnin’ Hopkins. PARADISE LOST – Mike Rowe looks at the blues and R&B heritage of Detroit in the 1940s and 1950s, with unique photos and graphics. THE M&R R&B INTERVIEWS: Part Three of this major interview series with Jonas Bernholm, blues record collector and owner of the Route 66 stable of reissue labels. 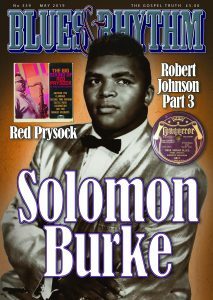 Part Three will cover the trial and tribulations booking tours with US rhythm and blues artists and a full listing of all of his reissue albums. 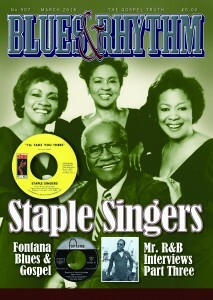 FONTANA BLUES & GOSPEL: Ray Templeton looks at the Fontana label and its series of releases of classic blues and gospel albums and EPs. JERRY LEE LEWIS: Tony Watson undertakes in-depth look the new Bear Family Sun Records set from ‘The Killer’. 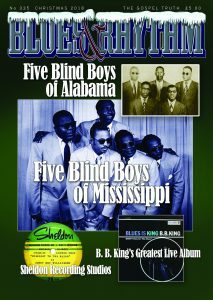 PLUS: Shirley Gunter; Long John Hunter; Joe Houston; Steve LaVere, Otis Clay; B. B. King; Under The Radar; Words, Words, Words; Chris’s Curiosities plus a full review section of CDs, DVDs Books etc. 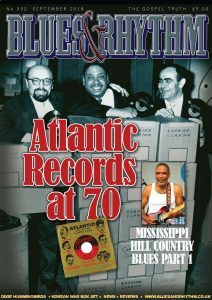 ATLANTIC BLUES ORIGINALS: Ray Templeton looks at the classic Atlantic album series featuring Professor Longhair, Blind Willie McTell, Texas Guitar, Detroit Blues etc. WHO WAS SHIFTY HENRY? Billy Vera spills the beans on the obscure R&B musician who was named checked on Elvis Presley’s ‘Jailhouse Rock’. 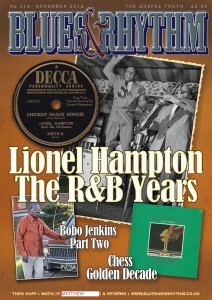 THE SUPER RARE DOO WOP BOX: Tony Watson takes an in-depth look at Rock Beat’s new box set of rare doo wop discs. PLUS: Allen Toussaint; Rev. Johnny ‘Hurricane’ Jones; Gene Norman; Rhythm Riot! ; Lucerne Blues Festival; Under The Radar, Words, Words, Words; Chris’s Curiosities plus a full review section of CDs, DVDs Books etc. 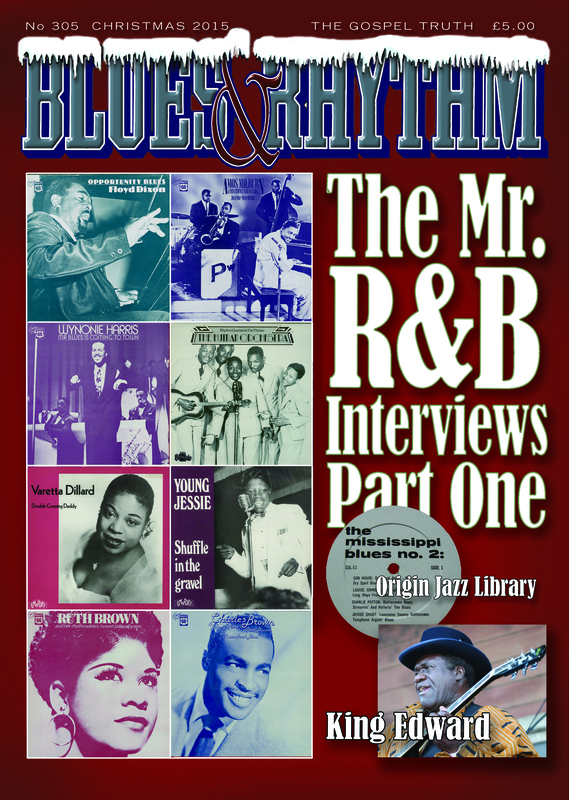 THE M&R R&B INTERVIEWS Part One of a major interview series with Jonas Bernholm, blues record collector and owner of the Route 66 stable of reissue labels. Part One will cover Jonas’s travels in the US searching out blues and R&B artists – complete with unique photos. ORIGIN JAZZ LIBRARY: Ray Templeton looks at this pioneering pre-war blues reissue label. KING EDWARD REMEMBERS JOHNNY HI-FI: Mike Stephenson follows up on Robert Pruter’s original research on the mysterious Chicago bluesman Johnny Hi-Fi in an interview with bluesman King Edward. RARE R&B SHEET MUSIC: Dan Kochakian shares some of his collection of rare sheet music from the 1940s and 1950s. PLUS: Words, Words, Words; Under The Radar; Chris’s Curiosities and tons of reviews of CDs, DVDs Books etc. THE LEGENDARY JAY MILLER SERIES: Part Two of this superb feature on Flyright’s ‘Legendary Jay Miller’ series of albums, by Ray Templeton. 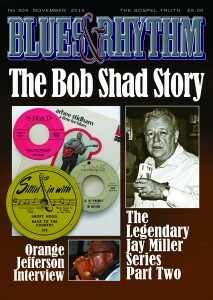 THE BOB SHAD STORY : Opal Louis Nations tells the story of legendary record man Bob Shad and his labels. ORANGE JEFFERSON: Who? 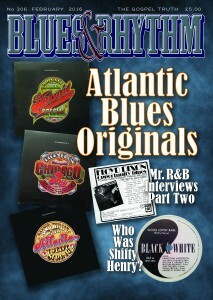 Scott M. Bock interviews more new blues talent. SWINGIN’ ON CENTRAL: Peter Vacher writes about his research for his new book on the Los Angeles R&B and Jazz scene in the 1940s and 1950s. THE LEGENDARY JAY MILLER SERIES: Part two of a major feature on Flyright’s ‘Legendary Jay Miller’ series of albums, by Ray Templeton. 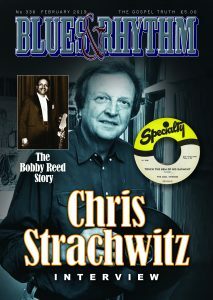 A great feature on a great record man! ACE RECORDS AT 4O! We asked John Broven to look at 40 years of one the great UK Blues, R&B, Soul and Reissue labels. 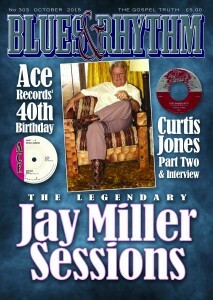 John tells the story of Ace Records. Great feature! PLUS: Juke Boy Bonner; Edinburgh Blues Festival; Mighty Sam McClain; Eddie Cusic; Don Kent; Words, Words, Words; Under The Radar; Chris’s Curiosities and much more. 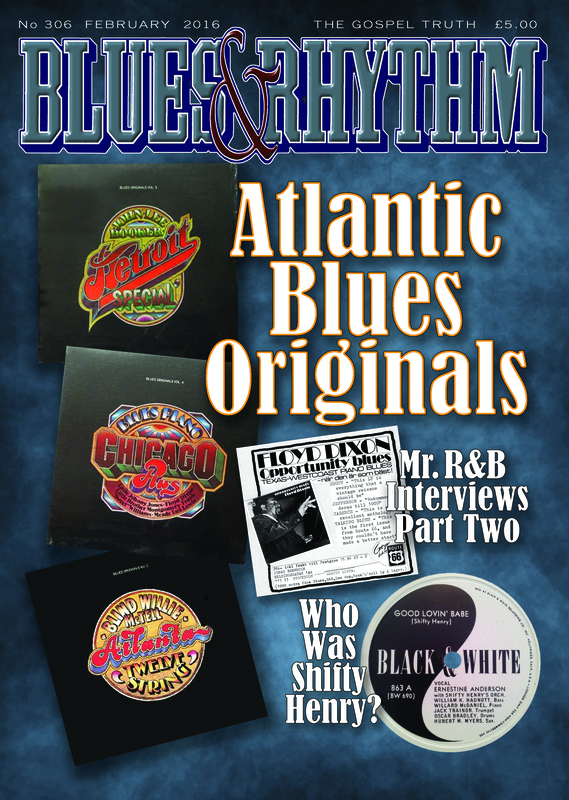 Current issues of Blues and Rhythm can be purchased for: UK £6.25 – Europe airmail £8.75 – USA, Canada, Japan etc: £10.00 – Australasia: £10.25. Prices include post & packaging. Lots of back issues still available at discount prices! Wanna do a deal? Just ask!